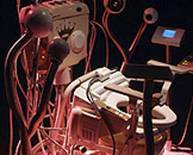 The artist Ian Haig is also interested in the interfaces but in Excelsior 3000 he takes it to new extremes. 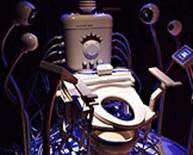 Toilets are cyborg technology and Haigs Excelsior 3000 moves to redefine the human bodies relationship with the toilet in the process of poking fun at the emerging market of high tech toilets. Excelsior 3000 by Ian Haig. 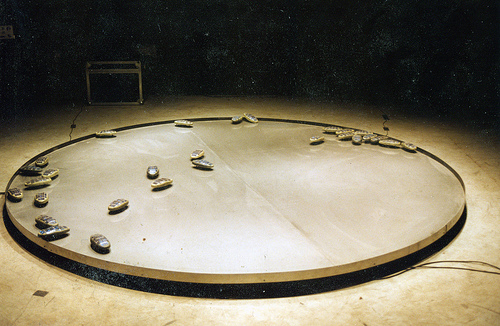 Bowel Technology Project, 2001. 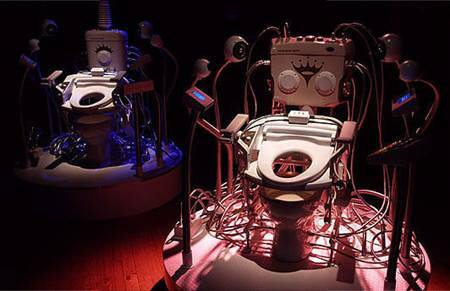 Haig has created an interactive toilet, which in essence becomes an extension of the human digestive system. organs and allow freedom of movement in the microcosm and the ability to perceive the movement and position of others. A brainwave sensor, placed on the head of the interactant, measures his or her brain activity, which is sent to the system and controls the intensity of projected light. The immaterial form of communication (brain activity) with the internal and external world become reciprocal and inverted. The more intense or erratic the viewer’s brain activity the less light will strike the robots and the more apathetic the behavior of the colony will be. Terrain 01 by Ulrike Gabriel. 1993. Photo compliments of William Veerbeek from Flickr Photostream.